Shootout Showdown was added to the Altador Cup during AC IV. 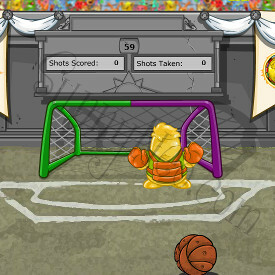 You take control of a Yooyuball player, trying to score penalties against the opponent's Keeper. The aim is to score 5 goals as quickly as possible, within 60 seconds, without missing or letting the keeper save your shots. Shootout Showdown can be a quick way to add some points to your team and your rank. The jelly chia goalie starts every shot in the left position, then moves to the center, right, center, then back to left. He will continue this pattern until you make a shot and the process is repeated. This can be used to your advantage to make goals rather quickly and efficiently. You use the arrow keys to move the ball into position or to angle your kick. The space bar is how you kick. Holding the spacebar down charges how hard you kick the ball. There is a meter to the bottom left that show how much power you have in your kick. At the end your score is made up of 3 parts. The amount of Goals, your time bonus, and your accuracy bonus. They are added together to give you your final score. You get 35 points for each goal you scored (should be 5 goals always, so 175 points). For your time bonus you get 14 points for every 1 second. So if you finish with 50 seconds left you get a 700 point time bonus. Your accuracy bonus is based on how many goals you got compared to how many shots it took you. If you get a perfect 5 goals for 5 shots, then you get 300 points. If it takes you anywhere from 6-10 shots to get 5 goals, you get 100 points for your accuracy bonus. If it takes you 11 shots or more to score 5 goals, then you get 0 points for your accuracy bonus. Since every time the kick is reset the Chia is in the positions: Left, Center, Right, Center, Repeat, you can aim accordingly. If you instantly move the ball to the right by tapping the right arrow key 3 times, this allows the Chia to move at the same place. However, by the time you shoot the ball, the Chia will be Center or Left and the right is clear to take your shot. So every time the shot is reset do this quickly: Right, Right, Right, Spacebar. You should be able to score 5 goals with no problem rather quickly. To make your gameplay go a little faster, you can use the keyboard to navigate the game before and after you play it. This removes a few seconds of moving the mouse around to click everything. First, position the mouse cursor in the darker purple of the goalpost under the "O" in Showdown. With your left hand, position your index finger on the tab key, and your thumb on the space key. With your right hand, position yourself on the arrow keys. To start the game, push the tab key twice which should put a box around "Start Game". Then with your right, hit the enter key to start the game. Do the Right, Right, Right, Spacebar to score your 5 goals. Once you finish, press the tab key twice to get a box around "Send Score". Hit the enter key, and the score will send. Then, the mouse is already in position to restart the game. 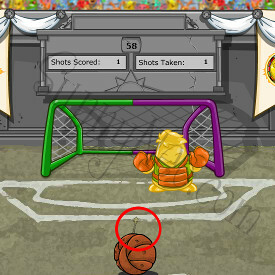 If you miss a goal, you can use the tab key to restart the game. Just hit "Tab" once to get the box around "End Game", press enter, and then you are back at the start. This strategy is very effective during By-Days where you don't face another team, and it is all about ranking up. You can quickly shoot the one goal for rank and use this Tab key strategy to get your games count up fast. After you get the timing down right, you'll notice around 40-50 plays later the chia seems to move slightly slower. The slight lag in the game will throw off your timing and may affect your accuracy. Simply refresh the page to restore the game to full speed and restoring your accuracy. This game was also part of the Altador Cup NC challenge. For each day of the cup you had to match or beat the posted score for that challenge to be eligible for the special unique prize. If you successfully completed all 34 game challenges, you earned an additional, extra-exclusive Neocash item prize! For more information, Read the NC Challenge Guide.